What is meant by “Application Layer” When Referring to Data Packets? Application layer is considered to be an abstraction layer that specifies some of the interface methods and shared protocols used by communication network hosts. This is also used in both standardized computer networking models namely the Open System Interconnection or OSI model and the Internet Protocol Suite or the IP model. Despite the fact that these models are similar as far as their level layer is concerned, their detailed purposes and definitions are still completely different. In IP model, the application layer is primarily consisted of interface methods and communication protocols which are thereby used in communication processes to the internet protocol computer networks. Their application layer can only standardize the communication. It will still depend on the underlying type of transport layer protocol. This will establish the host to be able to host information channel of transfer. This also helps manage some data exchange processes in a peer to peer or client-server networking model. Despite the fact that IP mode doesn’t emphasize specified data formats or rules that application layer needs to consider during communication processes, its original specifications do not recommend or rely on the principle of robustness as far as the application design is concerned. 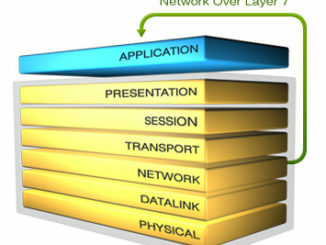 When it comes to the OSI model, application layer is even narrower in its scope. This defines application layer as an effective user interface. This is somehow responsible for the display of some received data and information to all users. In contrast with that, IP model is not concerned in such necessary details. OSI also explicitly differentiates the additional functionality below the application layer and above the transport layers namely; the presentation layer and the session layer. OSI also emphasizes strict functional modular separation of these two layers. They also offer some protocol implementations in each of the different layer. Seven layers with respect to application layer can be separated into two different parts. Layers one to tree are considered to be the transportation set consisted of physical layer, network layer and data link layer. When it comes to the physical layer, this transmits raw bits over communication channels. Now, the data link layer assures that the suitable physical protocols are assigned to the appropriate data. Network layers control subnet operations which are considered as identifiable network parts. These also decide just how the data will be sent to its recipient devices. Transport layer which is also the forth application layer sustains the flow of the data. Recovery of data and error checking are also a part of that specific type of layer. This also accepts some data, split it into smaller units and ensures that all pieces of data arrived properly. Layers five up to seven is considered to be the application layer set. Session layer allows users use different machines to be able to establish the best sessions between a user and a recipient. The presentation layer highlights semantics and syntax. This also converts the data sent at a standardized format. The final layer is the application layer which contains different types of protocols. This is a layer that interfaces with all other types of applications and operating systems that communicate data between messages, files and other networking activities. Each application layer offers different functions that you must be aware of. This is also especially if you want to obtain a smooth flow of data in your system. More information can be found on Wikipedia here. What is Latency and How Can It Affect Internet Access Speeds? Latency is one of the common issues to face when it comes to internet networks and connections. In connection with this, wired connections of network also tend to obtain a low latency. Nevertheless, wireless connections tend to obtain a higher latency. Now, latency refers to the different types of delays usually incurred into your network data processing. Low latency network connection highlights delay times while the high latency connections suffer from long term delays. Apart from the propagation delays, latency may consist of transmission delays as a physical medium property with processing delays like network hops and proxy servers on your internet. Satellite Internet Connections ( High Latency, High Speed) – You click a web page link and after noticing some delay, the web page will start to download and show up at once. Theoretical Connections (Low Latency, Low Speed) – You click a web page and then it starts to load instantly. However, this will usually take time to load the page as you see the images loading one at a time. Cable Internet Connections (Low Latency, High Speed) – You click a web page and you see the page that appears right away. Latency usually manifests delay. For instance, if you have to chat to someone using Skype using high latency connection of the internet, there will usually be a pause for a while. It is also somehow possible that the communication with each other might end up. If you will also play online games, expect that your actions and events will be delayed with this latency. Both latency and bandwidth depend on your internet connection. They are also simply affected by several factors such as the location of the remote server, network hardware, and the routers of the internet in between the server and the user. Moreover, the packets do not travel instantly via routers. In each router, the packet will have to travel with some delays for few milliseconds. This will also increase that depends on the packet delays that they will have to meet. However, there are some kinds of connections such as satellite internet connections that offer high latency even at its best condition. It also takes about 500 up to 700ms for packet to reach internet service providers towards satellite internet connections. Latency is not just a problem for satellite internet connections. This is also a problem to different types of connections around the world. This may delay the internet access speeds as you choose to browse a certain page in a web. For those who want to determine the extent of the effect of latency in your internet access speed, spare some time and effort to measure the latency. You only need to have access on the ping command of the web address and of your computer. This is by far a significant measurement process that can help you determine if you need to upgrade your computer and internet connection system even if the latency is already at its highest extent. What is the Role of a Firewall in Protecting Equipment from the Wider Internet?